Shadows is a film about interracial relations during the Beat Generation years in New York City, directed by John Cassavetes. The film stars Ben Carruthers, Lelia Goldoni and Hugh Hurd as three African-American siblings, though only one of them is dark-skinned. The film was initially shot in 1957 and shown in 1958, but a poor reception prompted Cassavetes to rework it in 1959. Promoted as a completely improvisational film, it was intensively rehearsed in 1957, and in 1959 it was fully scripted. The film depicts two weeks in the lives of three siblings on the margins of society: two brothers who are struggling jazz musicians, and their sister who dates several men. Hurd plays Hugh, a jazz singer hunting for a job, finally landing a gig at a sleazy club. Carruthers plays Ben, a trumpeter who hangs out with his friends, tries to pick up girls, and gets in fights. Goldoni plays Lelia, a flirtatious artist whose innocence is revealed through three relationships she has, one with an older white writer, one with a shallow white lover, and one with a gentle young black admirer. Goldoni's uninhibited performance leaves the strongest impression on the viewer. Film scholars consider Shadows a milestone of American independent cinema. In 1960 the film won the Critics Award at the Venice Film Festival. 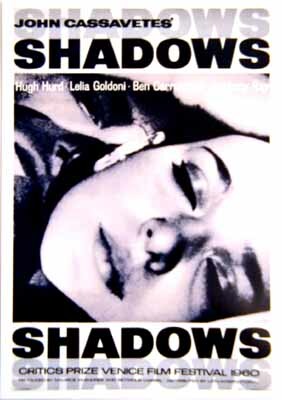 In 1993, Shadows was selected for preservation in the United States National Film Registry by the Library of Congress as being "culturally, historically, or aesthetically significant". In 1994, film critic Leonard Maltin said the film "was considered a watershed in the birth of American independent cinema."